» Downtown Phoenix is HOT! 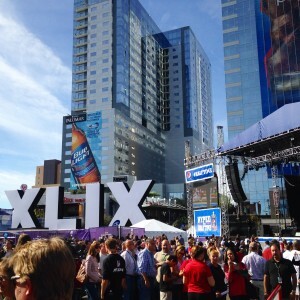 Phoenix has become a destination for popular events. 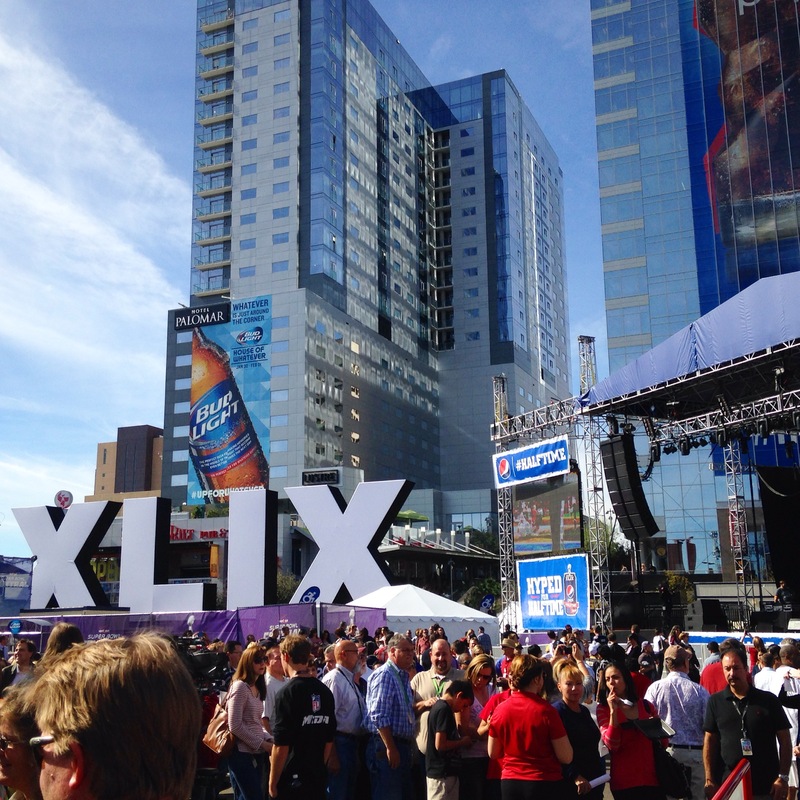 Most recently, the downtown Phoenix area served as the main hub for the 2015 Super Bowl, hosting an array of events, concerts, and activities related to the big game. Photo from City of Phoenix. Downtown Phoenix is hot in more ways than you can imagine! As the urban heartbeat of the city, downtown is pulsing with activity. Riding the wave of the recent Super Bowl successes including Super Bowl Central and the NFL Experience, downtown is a vibrant sought after destination! The new amenities in the area allows visitors to experience the Downtown Difference! The Downtown Difference consists of more than 800,000 square feet of retail space featuring popular brands, professional sports, live entertainment, great food and fun activities. CityScape, a 5-acre, mixed-use development that blends urban living with work, shopping and entertainment, includes notable restaurants, a hotel, offices and outdoor event space. The Arizona State University Downtown Campus is home to more than 10,000 students. The downtown area is home to the Walter Cronkite School of Journalism, College of Public Programs, College of Nursing & Health Innovation and the future home of the Sandra Day O’Connor College of Law. Photo from City of Phoenix. Downtown Phoenix has more than 4,800 residential units, 9,000 permanent residents, and a workforce of 64,000 daily. 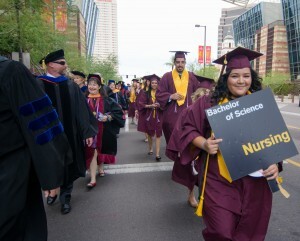 The Arizona State University Downtown Campus, which opened in August 2006 with 2,766 students, now has more than 10,000 students enrolled. 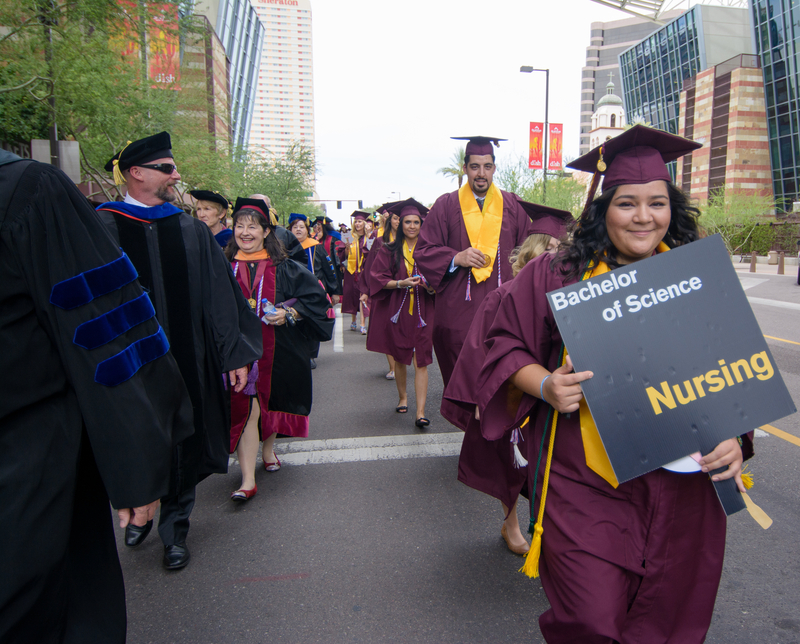 The campus, which is continuing to expand, is home to the Walter Cronkite School of Journalism, College of Public Programs, the College of Nursing & Health Innovation and other notable programs. The new law center, which will house the Sandra Day O’Conner College of Law, is expected to open in the fall of 2016. 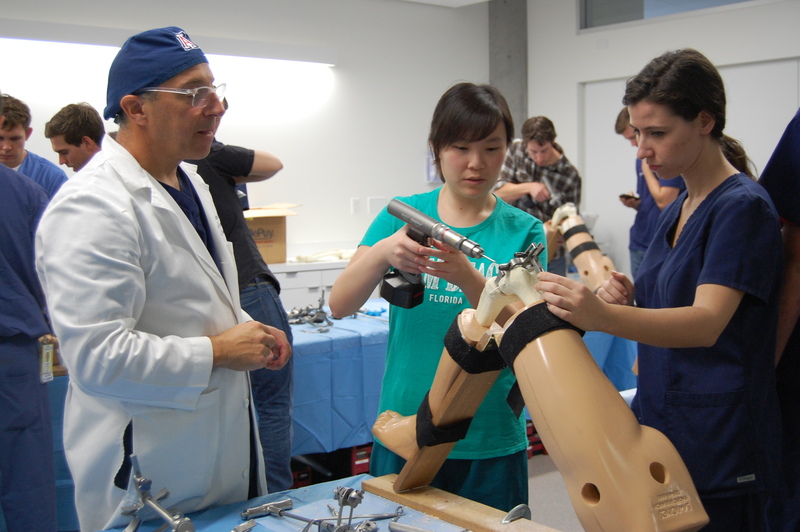 Education thrives in Downtown Phoenix! The Phoenix Biomedical Campus (PBC), the city-owned campus sits on 30-acres providing advanced medical training to students at the UA College of Medicine and doing cutting-edge research at the Translational Genomics Research Institute (TGEN). The campus looks forward to the opening of the 220,000 square foot $100M outpatient cancer treatment clinic operated by the UA Cancer Center and the St. Joseph’s Hospital and Medical Center, later this year. 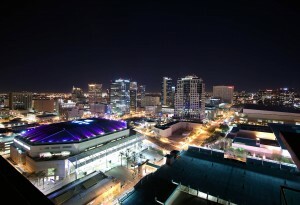 Downtown Phoenix is hot and attractive to new residents. High-rise projects such as 44 Monroe, Arizona’s tallest residential high-rise, opened its doors in 2008 offering 196 condos. The Summit at Copper Square, the second tallest residential tower, overlooks Chase Field, offers 165 condo units. 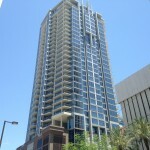 Downtown Phoenix residential developments continue to grow. Portland on the Park, is the anticipated urban project that will include 170 luxury condos and lofts in 3 structures ranging from 4, 12 and 14 story towers. The property is within walking distance of the Light Rail, Margaret T. Hance Park, and the Japanese Friendship Garden. The West Fillmore redevelopment project, which began taking proposals from private sector developers in spring 2015, will be one of the largest developments in downtown history. The 7.5-acre site is expected to meet the demand for downtown living, providing provide homes for 1,000 new downtown residents in addition to retail shops and restaurants. 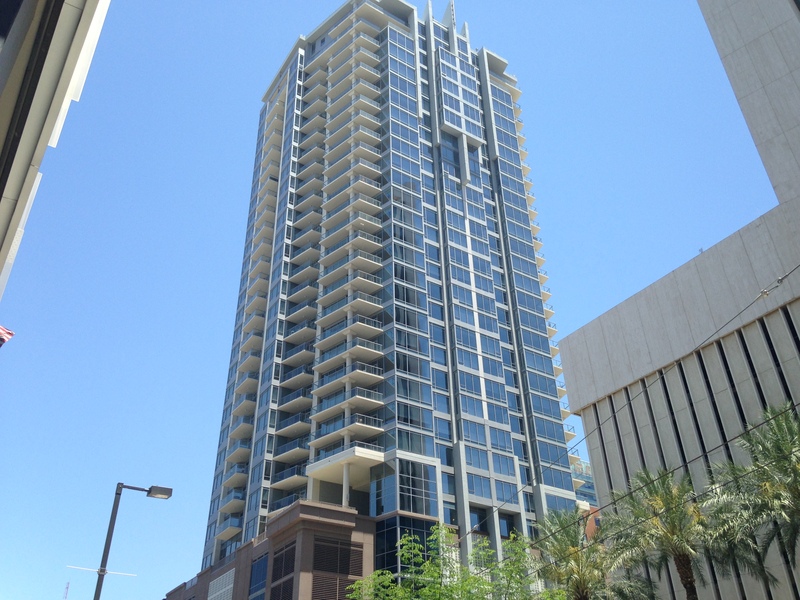 Phoenix is seeing many new residential high-rises opening in the downtown area. Photo from City of Phoenix. New employers and their employees are making Downtown Phoenix home. Jay Geier, CEO of The Scheduling Institute recently opened his Arizona Headquarters in the Warehouse District and cited that the location’s close proximity to restaurants, hotels, and entertainment is ideal for his clients when they fly in to town. Convenient transportation is key to the explosion of downtown development. The METRO Light Rail connects Downtown Phoenix to points throughout the city and the world. 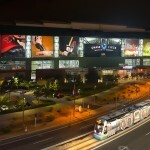 The commuter train launched in December 2008 provides reliable transportation connecting passengers from West Phoenix to the East Valley through Downtown Phoenix with dedicated stops at the Convention Center and Sky Harbor International Airport. 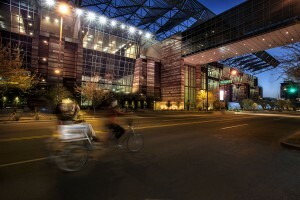 Speaking of the Convention Center, the expansion of the facility and construction of the 1,o00-room Sheraton Hotel enables Phoenix to accommodate 80% of the association meetings market and attract high profile events such as the MLB All Star Fanfest, NBA All Star Jamfest, WWE Fan Axxess and notable conventions such as the NRA and U.S. Greenbuild. In 2015, the Phoenix Convention Center welcomed the Super Bowl NFL Experience and looks forward to hosting fan fests for the College Football Playoffs in 2016 and the NCAA Final Four in 2017. Downtown has something for everyone! The redevelopment of Downtown Phoenix has redefined our city. The Downtown renaissance provides lasting memories with lively indoor and outdoor activities at CityScape, including Lucky Strike bowling alley, Stand Up Live Comedy Club and a host of bars, restaurants and shops. Sports fans will feel right at home at Chase Field where the Arizona Diamondbacks play and Talking Stick Resort Arena, home of the Phoenix Suns. Theater goers will enjoy visiting the Herberger Theater, Symphony Hall and the historic Orpheum Theatre. Downtown Phoenix is more than a destination, it is a community that makes residents and visitors from around the globe feel right at home! A view from above. 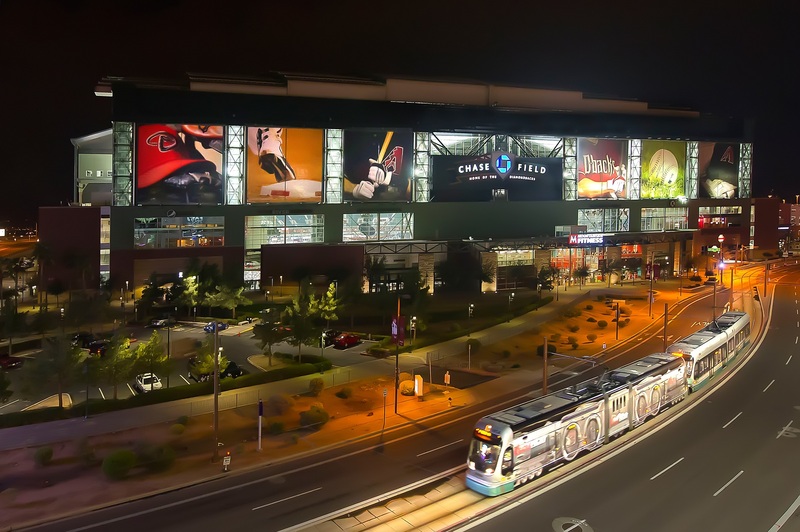 The City of Phoenix is home to professional sports facilities Chase Field and Talking Stick Resort Arena. Photo from the City of Phoenix. Posted on October 2, 2015 by League Staff in Arizona's Downtowns | Tags: Arizona, Arizona Downtowns, Arizona State University, Arizona State University College of Nursing and Health Innovation, Arizona State University College of Public Programs, AZ Cities @ Work, Chase Field, City of Phoenix, Downtown Phoenix, Herberger Theater, Maricopa County, METRO LIght Rail, Metro Phoenix, Orpheum Theatre, Phoenix, Phoenix Biomedical Campus, Phoenix City Council, Phoenix CityScape, Phoenix Convention Center, Phoenix Mayor Greg Stanton, Phoenix Symphony Hall, Sandra Day O'Connor College of Law, Sky Harbor International Airport, Super Bowl, Super Bowl 49, Talking Stick Resort Arena, University of Arizona, Walter Cronkite School of Journalism & Mass Communication | permalink.